Precision machining and quality of surface finish are major concerns for manufacturers of metal parts. The promise of a contactless method to machine surfaces with submillimeter precision and a clean surface, on metals of almost any hardness, might seem too good to be true. However, such a method, pulsed electrochemical machining (PECM), was the focus of a detailed investigation using numerical modeling presented at the COMSOL Conference 2016 Munich. Regular readers of the COMSOL Blog may recall that there are many electrochemical processes that allow precise control over the manufacture of metal objects and surfaces: for example, electroplating in which a substrate is made to act as a cathode so that a thin layer of metal can be electrodeposited on the substrate surface. In electrochemical machining (ECM), this process operates in reverse: an anodic current is applied at the substrate, causing removal of metal by electrolysis to an electrolyte solution that flows between the substrate and a cathode tool that is driving the current. 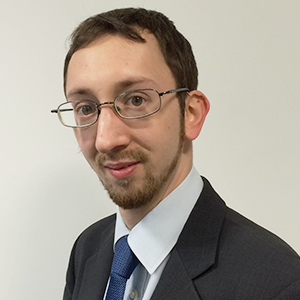 What are the advantages of electrochemical machining compared to other machining methods? First, there is no mechanical contact between the cathode tool and the substrate. Consequently, there is no risk of tool stress or breakage, as might occur with a mechanical cutting or finishing process. 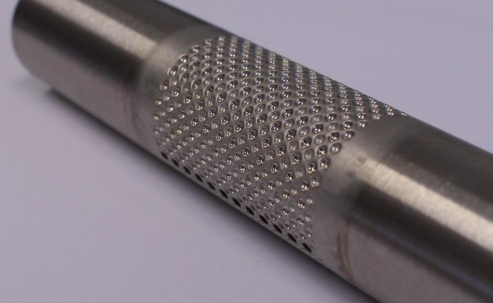 Electrochemical machining can shape the substrate quickly and, since it proceeds through a chemical reaction rather than a mechanical process, bulk mechanical properties such as hardness of the substrate do not directly affect the viability of the method. For the same reasons, the surface finish is in general very clean, since layers of atoms at the metal surface react directly without requiring mechanical abrasion or polishing of the surface. Also, there is no risk of frictional heating. Electrochemical machining can only be used with electrically conductive and electrochemically reactive materials that undergo electrolysis reactions, so this generally limits its application to less noble metals like aluminum or steel. This selectivity can also be a strength, since ECM can be applied in situ with nonconductive materials such as polymers that should not be machined during manufacture. Moreover, polymer pieces can be deployed to guide the spatial profile of machining in a similar manner to the use of masks in electroplating. Of course, electrochemical machining presents some challenges, too. Predicting the profile of current density and machining rate across the substrate can be a challenge. Although the cathode tool does not wear, it may still need to be refreshed due to deposition or surface blocking by electrolysis products. The generation of byproducts from electrolysis, like hydrogen gas bubbles, can also interrupt the application of current at the substrate. And, although there is no frictional heating, the Joule heating due to the flow of current in the resistive electrolyte can still be significant. One response to these challenges has been the development of pulsed electrochemical machining in which the applied current from the cathode tool is not constant. Instead, the current is applied in short bursts, which are timed with the tool moving up and down. This helps to refresh the electrolyte between the tool and substrate during the machining process. If the electrolyte is contaminated by by-products from the electrolysis, the rate of machining could be limited or poorly controlled. Another important approach to handling the challenges of ECM is the use of simulation to predict ECM behavior in real manufacturing cases. Let’s find out more about the part that modeling can play in optimizing the machining process. For several years, a group of researchers led by Matthias Hackert-Oschätzchen at Technische Universität Chemnitz in Saxony, Germany, have developed simulations of electrochemical machining using the COMSOL Multiphysics® software. This research is in collaboration with Andreas Schubert and other researchers based at the Fraunhofer Institute for Machine Tools and Forming Technology, also in Chemnitz. These researchers took advantage of the capability to combine different physical phenomena in a single model to consider several interacting physical effects that are important in improving the understanding of PECM. For one project, Hackert-Oschätzchen with M. Penzel et al. considered a “precise” electrochemical machining method capable of manufacturing the intricate surface geometry of dies for stamping or extrusion, specifically considering the creation of small dimples or “calottes” in the metal surface. ECM can be used to manufacture intricate geometries, like this calotte-structured surface. Here, a pointed cathode tool is used to cause highly localized removal of material from the workpiece. Experimental information describing the detailed chemistry of the surface interaction was incorporated into the model by means of empirical (tabulated) functions for the dependence of electrolyte conductivity on gap thickness, and for the dependence of material removal rate on current density. 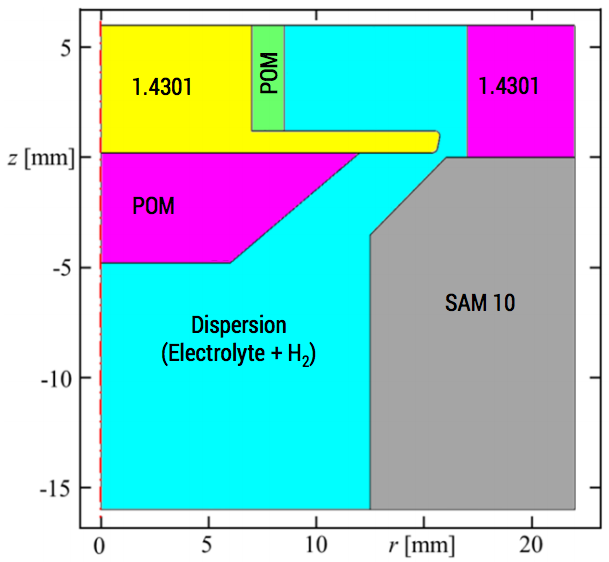 By modeling the time-dependent motion of the cathode tool, the researchers predicted a profile for the machined calotte shape after 25 minutes of dissolution of stainless steel 1.4301 at 6.2 V applied voltage. The relation between the tool shape and the profile of the machined geometry yields helpful information to guide further process design. The normalized current density after a 25-minute simulation time. In another study, Hackert-Oschätzchen with M. Kowalick et al. investigated multiphysics effects in the pulsed electrochemical machining process on stainless steel 1.4301, including heat transfer and the chemical influence of the by-products. Their model incorporated a description of the fluid flow due to electrolytes forced through the narrow gap between the tool and the substrate, as well as the volume fraction of hydrogen gas generated in the electrolyte. 2D axisymmetric geometry for a PECM simulation. The hydrogen gas is a by-product of the electrolysis reaction at the cathode tool. Since hydrogen bubbles are not electrically conductive, the overall electrolyte conductivity is lowered in regions where hydrogen bubbles accumulate. In turn, this lowers the local current density and machining rate on the substrate. In particular, the lateral working gap region was identified as a region where machining rate was limited. 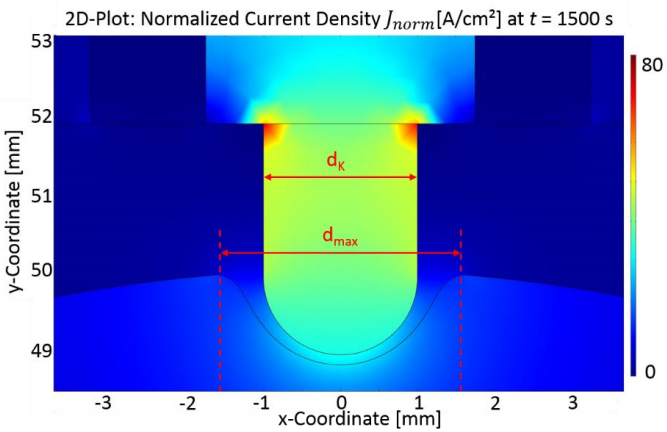 According to the researchers, an accurate prediction and optimization of the cathode tool would depend on consideration of the influence of hydrogen by-products retarding current flow, as well as the thermodynamic effect of temperature gradients due to Joule heating. With multiphysics analysis, the research group was readily able to include all of these effects, building on an understanding of an ECM process design developed progressively through their simpler models. We were inspired by the theoretical research from the Hackert-Oschätzchen group and developed one of their published works into a tutorial model that can help other simulation engineers get started with ECM simulation. The Electrochemical Machining of a Microbore tutorial model comes from a study of a conventional (not pulsed) electrochemical machining model described in a presentation at the COMSOL Conference 2012 Milan. Download the model from the online Application Gallery or through the Application Library in the COMSOL Multiphysics software. The example comes with step-by-step instructions. P.S. You’re invited to this year’s COMSOL Conference!